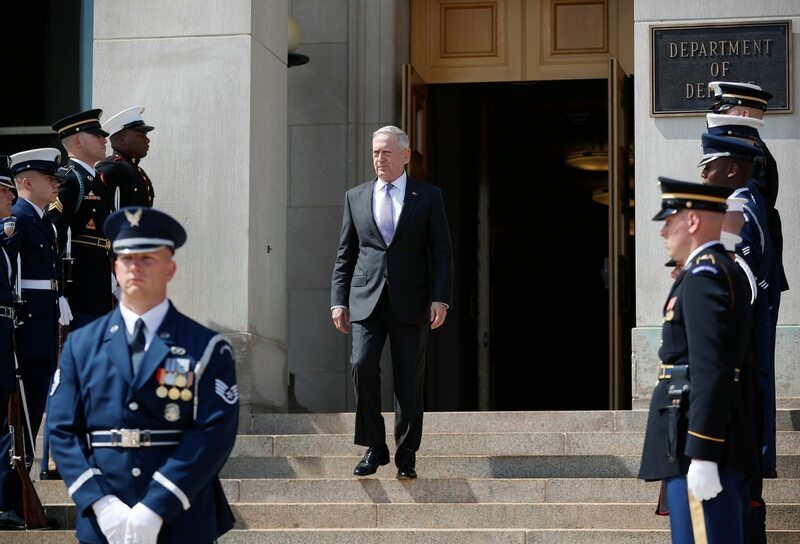 WASHINGTON — Defense Secretary Jim Mattis, in one of his first directives while heading the Pentagon, subtly ordered military leaders to accelerate internal procedures for initiating, vetting and approving combat valor awards, Military Times has learned, a significant policy shift meant to ensure America's war heroes are recognized with minimal delay. Within the armed forces, there are few subjects treated with greater pride and sensitivity than personal awards and decorations. Mattis's change, implemented military-wide in recent weeks, addresses a longstanding frustration shared by rank-and-file personnel and commanders alike who in many cases have waited years to see battlefield feats acknowledged. A two-paragraph memo from Mattis to each of the military service secretaries makes clear the retired Marine's intent: "The demands and sacrifices of military service on the Soldiers, Sailors, Airmen, and Marines under our charge are significant," it says. "I know you share my commitment to ensuring appropriate and timely recognition of their service, particularly for acts of valor." A copy of that internal communication was provided to Military Times on Friday. READ THE MEMO: Valor award timelinessThe memo is dated Feb. 28, about five weeks after Mattis was sworn in as defense secretary. It requires that all valor award nominations — up to and including those for the Medal of Honor — must be addressed within 10 days at each tier of the approval process. The Medal of Honor, whose nominations must be endorsed by the defense secretary before being sent to the president for final approval, is the highest award for combat valor followed by the Service Crosses and the Silver Star. Those awards are approved at the Pentagon by the services' top uniformed and civilian leaders. With these higher-level awards, it means nominations should work their way up to a general or admiral within 30 days or so, meaning a determination should require months — not years. For valor awards such as Bronze Stars and Commendation Medals, which can be approved at lower levels of command, Mattis's order will greatly speed the time between combat action and recognition. Thousands of U.S. troops have received valor awards since the invasion of Afghanistan in October 2001. To safeguard their integrity, the approval process is necessarily rigorous. But too often nominations can stall within the military's bureaucracy, whether for political reasonsor to satisfy commanders' desire for deeper scrutiny. Mattis is not pushing for more awards to be approved, officials said, only to be acted upon more quickly and consistently. "There's an awful lot going on for the commander of an organization," said Pat Mulcahy, the Defense Department's director for officer and enlisted personnel management. She and her staff held a key role in ensuring Mattis's guidance became policy. "But recognizing valorous acts should be high up there on the priority." Mattis spent 44 years in uniform before retiring in 2013, time that included high-profile command assignments overseeing combat forces in Afghanistan, Iraq and other dangerous locations central to the war on terror. For him, this policy change is a product of personal observation and experience, Pentagon officials said, and his desire to do right by those who fight the nation's wars. Mattis is deeply respected — in the Oval Office, on Capitol Hill and throughout the Defense Department — for his plain-spoken wisdom and unflinching advocacy for the comparatively few in American society who've volunteered for military service since 9/11. He holds especially dear those who've seen the very worst of war. This initiative, officials said, also is tied to Mattis's belief that the military must improve how it interfaces with the public. He often speaks about this dynamic and has co-authored a book on the subject. Titled "Warriors & Citizens," it explores what he considers a dangerous gulf between those who serve and those who know very little about the men and women who sacrifice on their behalf. And despite its brevity, the directive offers rare insight into the defense secretary's management style, showcasing his desire for efficiency and an insistence that his subordinates address challenges independently. "Your plan," the memo concludes, "will include a description of your existing process, the timeline for implementing these changes, challenges associated with such accelerated processing, your mitigation strategy for addressing these challenges and recommendations for any changes to Department policy that would enhance your ability to achieve this processing requirement." Though Mattis's valor-awards policy is new, some of the services have already reported that nominations for high-level awards — a definition restricted to Silver Stars, Service Crosses and Medals of Honor, officials said — are being processed in accordance with the 10-day target. They declined to discuss any pending nominations. Mulcahy also emphasized that, despite a desire to accelerate the initiation and approval processes, all new nominations will continue to be vetted diligently. Likewise, the new policy won't preclude the Pentagon from reviewing cases that, for whatever reason, don't hit the timeliness target. the intent that it doesn't come forward."